So what is baklava? It is a Middle Eastern dessert, with quite a few countries claiming its origin although nobody can be sure of where exactly it originated from. And depending on the spices, types of nuts and syrup used, it will be traditional to that particular country. However the most common way uses filo pastry which is layered with chopped nuts baked until golden, then soaked in syrup and cut into diamond shapes. It is super easy to make, all you’ll need is a little patience working with the filo pastry which can be a bit fiddly at times (but I’ll give you a couple of good tips on how to work with it). 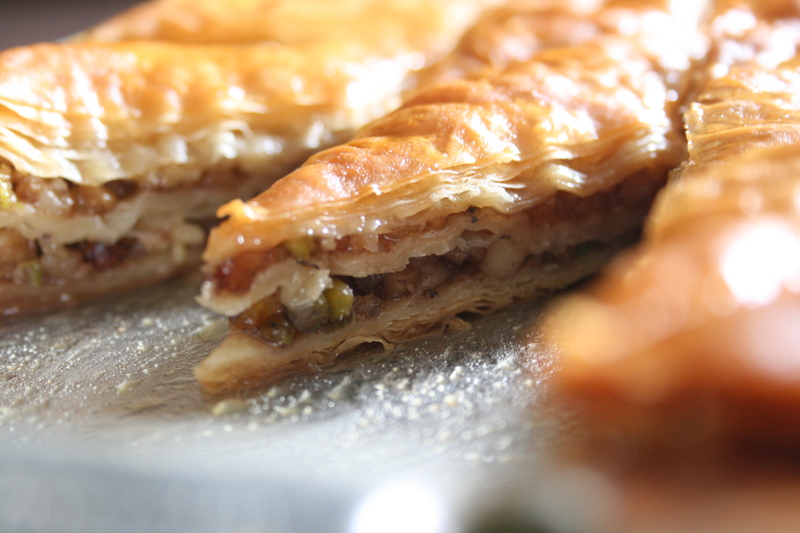 And if you have never tried baklava before, you absolutely must, you don’t know what you are missing! Filo pastry: it is very fragile and should be handled gently. If you are using frozen filo you need to remove it from the freezer the day before and place it in the fridge. Remove it from the fridge two hours before you want to start using it. It should be fully thawed otherwise it will just crack and break into pieces (I once tried using it shortly after taking it out of the freezer, and ended up with pieces of filo all over the counter top and not a very tidy baklava). The other thing to know, is that filo dries out extremely quickly. You will not be able to finish layering your baklava before it starts drying out, so a handy tip is covering the unused filo with a damp teatowel. Finely chop the nuts. I used a selection of walnuts, pistachios, slivered almonds and macadamias, but you can use what ever you want. Your life will be made so much easier if you have a food processor to chop them for you, otherwise by hand is also fine. Mix the nuts with the brown sugar and cinnamon and set aside. Cut the filo sheets into the right size and shape of your pan. I use a 28.5 x 19cm size pan so if I cut my filo in half I get 36 sheets out of the box. Using a pastry brush, brush the base of the pan with melted butter and place down your first sheet of filo. Brush the entire sheet of filo with melted butter (you will need to repeat this after each sheet). Layer with another 11 sheets of filo, then sprinkle with half the nut mixture. Place a sheet of filo over the nuts, then brushing with the melted butter repeat the process with another 11 sheets. Sprinkle the remainder of the nuts, and layer with another 12 sheets. Generously brush the final sheet with butter. Cut the baklava into diamond shapes before putting it into the oven. Note: If you put the whole pan into the freezer for about 10 minutes it is much easier to cut into shapes. Bake for about 35 minutes or until golden on top. To make the syrup, combine the water, sugar and cinnamon stick in a saucepan. Stir over medium heat and bring to the boil. Let it simmer for about 5 minutes, without stirring. Remove from the heat and let it cool. When the baklava comes out of the oven, slowly pour the syrup all over. …be fearless and have fun! These look so elegant! Lovely images. 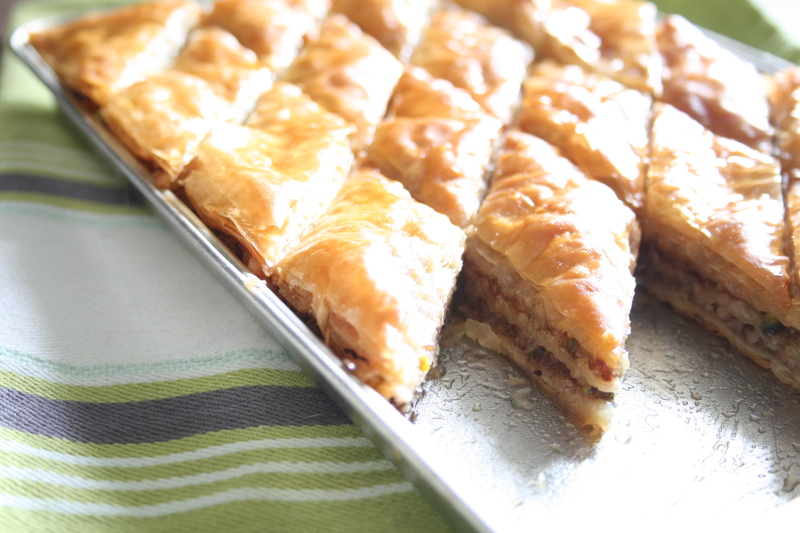 Love baklava and these look just perfect! Hi Este, thanks for sharing this recipe! Made a vegan version by using vegan margarine instead of the butter and using brown sugar throughout, absolutely divine!! Oh how lucky, would love to go there one day. What is the baklava like there?? Put it to the top of your travel list, it’s incredible and so much fun buying baklava and turkish delight then eating it looking at such an exotic skyline. Food always tastes better when you have the sounds, smells and sights of the local area. And of course, the ingredients are local and fresh. Oh how lovely…yummmm turkish delight!